Touted by some as the next evolution of apps and others as the critical first step in enabling realistic human-to-machine interactions, bots have become the hot new topic of the tech industry. So far there are few examples of really useful bots, but a 19-year-old Stanford University student’s creation is getting some well-deserved attention. 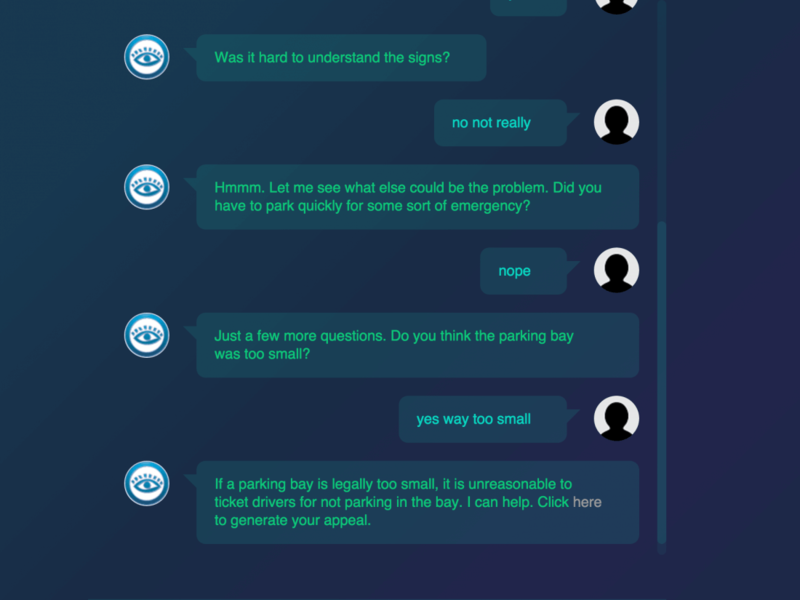 Self-described as “the world’s first robot lawyer”, DoNotPay helps users contest parking tickets in an easy to use chat-like interface. Since the first version of the bot was released in London last fall, it has successfully helped users challenge 160,000 traffic fines out of 250,000 -- that’s a success rate of 64% -- resulting in savings of over $4 million. Joshua Browder, the self-taught coder behind DoNotPay, explains that after realizing how formulaic the appeals process is, he decided to create a simple bot to help people challenge unfair tickets. The service works out whether an appeal is possible, asking users if there were visible parking signs or how big the parking space was, for example. Based on your answers if there are grounds for an appeal DoNotPay will generate it for you. DoNotPay currently works in London, New York an will expand to Seattle next. Following the success of DoNotPay, Browder has begun work on a bot to help people with HIV understand their legal rights, one to collect compensation for people whose flights were delayed beyond four hours, and another one to help refugees apply for asylum.